In our new Sports Bar Review series, Brian Maahs will be imbibing across Portland in search of the perfect mix of booze, food, sports and atmosphere. Check his scorecard at the end to see how he ultimately thinks each sports bar stacks up. When I started this series of reviewing sports bars, I had no idea how much fun I would have discovering new and exciting places. Charlie’s in Vancouver is the third bar I’ve reviewed and it truly has just about everything a sports bar enthusiast could ask for. I just wish it was closer to where I live. 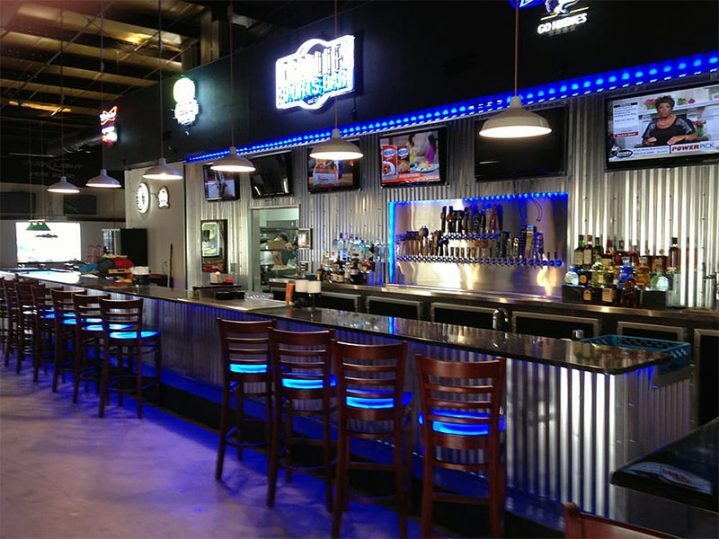 Located in a business park, Charlie’s is spacious enough to house its Keg Warehouse featuring up to 44 taps. That’s right, 44! Also, almost every square inch is covered with high definition flat screen T.V.’s, 47 to be exact. There’s also a family section which allows minors until 10 p.m. and an outdoor smoking patio complete with its own T.V. so you won’t miss a second of the big game. Other features include free WiFi, two electronic dart boards, pull tabs, three pool tables, Golden Tee, and a shuffle board. Where the walls haven’t been completely covered by televisions, air brushed graffiti art provides patrons with an amusement park vibe which fully immerses you into Charlie’s world. Daily food and drink specials include 25 cent wings on Wednesdays and signature cocktail buckets such as Charlie’s Rum Punch Bucket, Paradise Punch Bucket, and Long Island Bucket. Sundays are made special with $4.50 Bloody Mary and Mimosa bars. There’s also a $4 daily beer special which rotates through Charlie’s myriad of beer taps. Happy hour is from 3-6 p.m. and 9 to close Monday through Friday. The menu is packed with all types of food including pizza and more drink/beer choices than I have ever seen in one place. I highly recommend Charlie’s to anyone in the Vancouver area who wants to have the ideal sports bar experience. Brian Maahs is an avid sports fan, fisherman and youth football coach. When he's not reviewing Portland's best sports bars, he's usually researching fantasy football or planning his next fishing trip.